I am a mother with two young children at home. One of my biggest challenges is to create exciting new dishes for my family each day. We love to try new ingredients or new combinations to make them fun and delicious. Let's cook together. It will be a fun ride. I promise! So my little boys had a friend over to spend the night with them and I wanted to make their morning very special with a really fun breakfast. Who wouldn't like pancakes, right? how about if they are like eating red velvet cake for breakfast? great idea! so after researching several websites, choosing from here and there, I came up with what I am sharing with you right now! For the Pancakes: Sift the flour, cocoa powder, baking soda, baking powder and 1/2 teaspoon salt into a large bowl. Beat the eggs and granulated sugar in a medium bowl until pale yellow; beat in the buttermilk, melted butter, food coloring, vanilla and vinegar. Add the egg mixture to the flour mixture and fold just until incorporated. Heat a griddle or large nonstick skillet over medium-low heat. Lightly coat the hot skillet with melted butter. Pour 1/4-cupfuls of batter on the hot skillet, spaced evenly apart; use a spatula to spread out slightly if needed. Cook until bubbles begin to pop on the surface, about 3 minutes. Carefully flip and cook until the bottoms are set and the pancakes are cooked through, 1 to 2 minutes longer. Repeat with the remaining batter. For the Icing: Cream sugar and cream cheese until smooth and fluffy, slowly add the sugar and salt. Once all incorporated add vanilla and finally the heavy whip cream. The consistency must be runnier that regular icing in order to drizzle it on top of the pancakes. To serve, stack the pancakes on a pretty platter, drizzle the cream cheese and top it with syrup and sprinkle with the toasted pecans. Enjoy! Source: Recipe for Pancakes courtesy of Food Network, slightly adapted. Hello! I am back after a long time vacation from the blog! Today, I want to share a recipe that I created tonight inspired in so many White Turkey Chili recipes out there but wanted to give it my own touch. The weather got freezing very fast this weekend, and what can be better that a hearty soup to warm ourselves, right?! ;-) Hope you really enjoy it! In a Dutch oven, drizzled some olive oil and brown the ground turkey. Season with salt and pepper to taste. Once the turkey is cooked, reduce heat to medium. Add minced jalapeños, onions, celery, garlic, cumin, coriander, and 1/4 teaspoon salt. Cover and cook, stirring occasionally, until vegetables soften, about 10 minutes. Transfer 1 cup cooked vegetable/turkey mixture to a food processor work bowl. Add 1 cup of beans and 1 cup of broth and process until smooth, about 20 seconds. Add this mixture, remaining 2 cups broth, and beans to Dutch oven and bring to boil over medium-high heat. Reduce heat to medium-low and simmer, covered, stirring occasionally for 10 to 15 minutes. Stir in lime juice, cilantro, chives into chili and return to simmer. Adjust seasonings with salt and pepper. If you want an extra kick add some more jalapeños or a teaspoon of chili powder. Serve topped with sliced avocados, chopped tomatoes, cheese and cilantro. I'm back with one classic made completely from scratch! For those cold winter days in Chile or if you so happen to have a rainy summer here in the US and need some comfort food, here is your recipe! Very easy to make and incredibly delicious! In a large pot, heat the bacon grease over medium-high heat. Add the tasso or ham and cook, stirring, for 1 minute. Add the onions, celery and bell peppers to the grease in the pot. Season with the salt, pepper, and cayenne, and cook, stirring, until the vegetables are soft, about 4 minutes. Add the bay leaves, parsley, thyme, sausage, and ham hocks, and cook, stirring, to brown the sausage and ham hocks, about 4 minutes. Add the garlic and cook for 1 minute. Add the beans with the juice and stock or water, stir well, and bring to a boil. Reduce the heat to medium-low and simmer, uncovered, stirring occasionally, until the beans are starting to thicken, about 45 minutes. Remove from the heat and with the back of a heavy spoon, mash about 1/4 of the beans against the side of the pot. Continue to cook until the beans are creamy, 15 more minutes. Remove from the heat and remove the bay leaves. Serve over rice and garnish with green onions. A couple of mornings ago I was brainstorming for a quick breakfast treat to take to some friends. After a few searches on "Pinterest" I came across with this easy and delicious recipe! Grease generously 6 wells of a muffin pan with butter. In a frying pan, cook bacon about 3-5 minutes, until partially cooked but not completely crispy. Transfer to a paper towel-lined plate. Cut out rounds of bread with the help of a 3.5-inch round cookie cutter. Press the bread rounds into the greased muffin wells. Curl a piece of bacon around the periphery of each piece of bread, positioning it between the bread and the muffin tin to help keep it in position. Sprinkle a bit more than a tablespoon of shredded cheese in the center of each piece of bread and bake for 5 minutes. Then, One at a time, crack an egg, removing about half of the white, and dropping the remaining white and yolk over each piece of bread, being careful not to break the yolks. Once all the bread pieces have been topped with eggs, bake it again until eggs are cooked through to your liking (about 6-10 minutes) and bacon is crispy. Run a knife around the edge of each muffin well and pop the egg cups out. Season with salt and pepper to taste and serve immediately. Preheat oven to 350ºF. Grease and flour a pie pan. Set aside. Transfer the dough to the pie pan and spread it around covering the base and sides of it. Chill in the refrigerator while you prepare the filling. For the filling: Combine the flour, sugar, vanilla and orange zest. Mix and add the eggs and a splash of the milk. Once it has the consistency of a paste, add the remaining milk and wine. Transfer to a sauce pan, bring it to a boil. Transfer to a bowl and cover the surface of the cream with clear plastic wrap and let it cool. Once the filling is cooling, wash and dry the apples. With the help of a vegetable peeler (I recommend the type that looks more like a pencil than the type like a "Y"), start peeling the apples until you get to the core. Don't worry if some of the strips cut off. You'll be able to use them anyway. Start wrapping the apple strips simulating a rose bud. Assemble: Get the pie crust from the fridge and pour the filling over it. 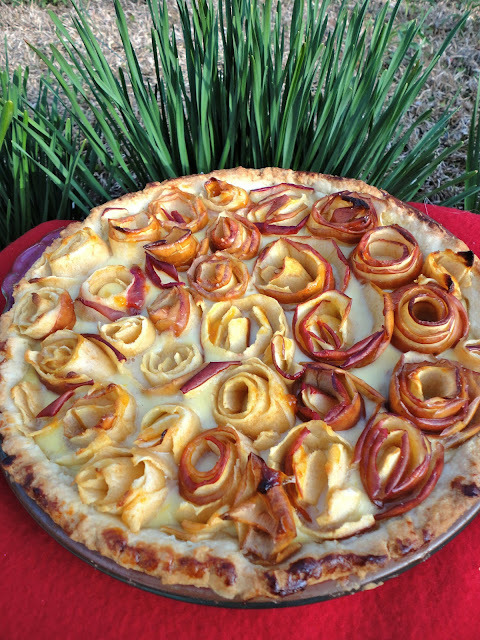 Place apple roses on top of the custard and continue arranging them until the whole surface of the pie is full. Cook completely and serve at room temperature. Source: Recipe Courtesy of "yoli-www.blogspot.com" - Slightly adapted. Nothing screams Fall like a good apple cake. This recipe is really delicious. Forget about the old dense apple cake that feels like a brick in your tummy. Rather, think it now like a fluffy and light apple cake, almost like a good muffin consistency, then dressed it up with this scrumptious brown sugar icing, and to balance it all up a sprinkle of flaky french sea salt and some more chopped pecans. The result is just amazing. Preheat oven to 350ºF. Prepare a bundt cake pan with melted butter and lightly dust with flour, or use the regular "joy of baking" cooking spray. Beat butter and both sugar until creamy, for about 3 to 5 minutes. Add the eggs one at a time. In the meantime, mix the dry ingredients (flour, baking powder, salt and cinnamon) and stir them with a fork. Mix the wet ingredients (oil and vanilla). Add the dry ingredients to the batter in three steps alternating with the wet ingredients. Mix until just incorporated. Finally, add the apples and pecans and mix them with a spatula. Transfer the batter to the prepared pan and bake for 40 to 45 minutes. Let it rest for 10 minutes in the pan and then transfer to a cooling wrack. Once the cake is almost cooled, start preparing the brown sugar icing. Melt the butter in a small saucepan over medium heat. Stir in the brown sugar and cook, stirring, until the sugar melts. It might look separated, but that's okay. Stir in the cream, and it should all come together. Bring the mixture to a boil, then pour it into a mixing bowl to cool for 10 minutes. After 10 minutes, stir in the confectioners' sugar, salt, maple extract, and vanilla. Beat well. If the mixture appears too thin, add more confectioners' sugar, if it's too thick, add a spoonful of hot water. Be aware that it sets up QUICKLY. Pour it over the cake while it's still warm. Decorate right away with chopped pecans and french sea salt, if desired. Source: Brown Sugar Icing - Recipe Courtesy of "Cake0rDeath"
I've made many pumpkin desserts but this one is simply amazing. Never ever tried something so light yet so scrumptious and delicious. Flaky, balanced, with great texture yet dissolves like a cloud... let me introduce you to "Sweet Pumpkin Strudels". So, if you're looking for something more sophisticated yet easy to make than pumpkin pie for the holidays, this is your recipe! For the filling: Combine the pumpkin, cream cheese, brown sugar, cinnamon, salt, ginger and nutmeg in a small bowl. Mix until nearly uniform and set aside. Place a well-rounded tablespoon of the filling about 2 inches from the end of the dough strip. To shape, fold the bottom edge of the Phyllo up and over the filling. Fold in the sides and roll up to encase the filling, brushing the exposed dry Phyllo with some of the butter as you roll. Place the rolled strudel on a baking sheet, seam-side-down. Brush the top of the Phyllo with some of the butter. Repeat with the remaining ingredients. Sprinkle the tops of the strudels with pecans and turbinado sugar. Bake until the phyllo is golden brown, about 15 minutes. Serve the strudels warm drizzled with the honey and topped with whipped cream if using. I'm a mom to two precious little boys and married to a wonderful man. We've discovered our passion for food as a family and we'll try to share these special treats with you! Come and follow us!